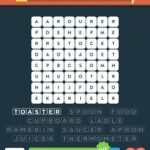 Stuck in Wordbrain 2 In The Kitchen (Word Enchanter 8×8). Here are the answers. Toaster. Spoon. Food. Cupboard. Ladle. Ramekin. Saucer. Apron. Juicer. Thermometer. I cannot get level 3 kitchen to work out. I know the answers but cannot get it to fall into place! !